Facebook turns 10 years old this week, and much of the conversation around its decadal anniversary has centred on whether its extraordinary rise will continue, or if the social networking behemoth is already on the wane. The most oft-cited argument of the Facebook naysayers is that it is becoming passé among teenagers, who some say are increasingly turning to upstart competitors Snapchat and WhatsApp. However, the company recently posted annual revenues up 55 per cent to £4.8bn, a large portion of which came from its increasingly profitable use of mobile advertising. In order to maintain and accelerate this pace of growth, Facebook would do well to focus on new emerging markets, rather than fickle Western teenagers. This brings us to Brazil, which has embraced social media and is now Facebook’s second biggest market after the US. Globally, the average time spent on Facebook dropped two per cent to 361 average minutes per month in the year to September 2012, while in Brazil it grew by 208 per cent to 535 minutes. What’s more, spending on online ads in Brazil is projected to double to £2.4bn over the next four years. 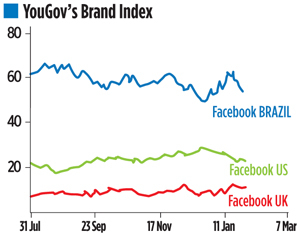 Turning to YouGov BrandIndex, which is now active in Brazil, we see that Facebook has an overall Index score of 54, which is more than twice as good as its consumer perception score in America (24) and four times better than in Britain (13). BrandIndex also shows that Facebook is benefitting from huge word of mouth exposure in Brazil, where 73 per cent of people say they’ve spoken about the brand with friends and family over the past two weeks, compared to 46 per cent in the US and 26 per cent in the UK. These numbers help illuminate the scale of the opportunity for Facebook – and indeed, its competitors – in Brazil. Despite the naysayers, ten years on Facebook’s star is far from fading.